Today, ASH Group LTD, headquartered in Wrexham, has been shortlisted as a finalist for the Most Innovative Use Of Digital Technology Award at the 2018 Digital Entrepreneur Awards (DEAs). 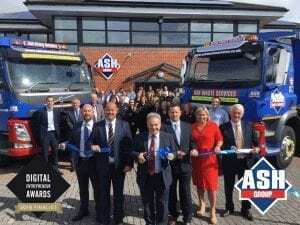 The ASH Group is a multi-brand Waste Management Business incorporating 2 Skip Hire Businesses, 2 Waste Management Businesses, a Metal Recycling Business and a Secure Storage Business. Initially found over 25 years ago as a skip hire firm with one skip in Bretton, Flintshire, we now manage over 7000 commercial customer accounts, as well as servicing over 5000 domestic customers a year with a variety of waste management solutions. The finalists beat off competition from hundreds of businesses that entered, across 20 award categories. The awards, now in their 14th year, cover categories encompassing every component of today’s online business ecosystem – from enigmatic leadership to forward-thinking development and cutting-edge creative. Categories include Social Media Campaign of the Year, Most Innovative use of Video or Animation and the coveted Digital Entrepreneur of the Year award. Previous winners of the awards span a range of sectors, from retail giants like Sainsbury’s and Mothercare to smaller, more agile digital specialists like Social Chain and Clicky Media. Among the judging panel are Jacqueline de Rojas, president of techUK and chair of the Digital Leaders Board; Heather Waters, enterprise manager at NatWest; Vikas Shah, CEO of Swiscot Group; Susie Ma, founder and CEO of Tropic Skincare; Naomi Timperley, co-founder of Tech North Advocates and chair of Capital Pilot; and Jon Woodall, founder & managing director of Space 48. One of the UK’s true tech heavyweights joins the judging panel this year. President of techUK and chair of Digital Leaders, Jacqueline de Rojas serves on the government’s Digital Economy Council and is an advisor to a number of fast-moving tech companies. Commenting on the DEAs, de Rojas said: “We are known as a nation of innovators and of entrepreneurs. It is quite simply a privilege to judge the technologies and innovators at the frontier of change. “The UK is a nation of technological significance and shining a light on entrepreneurship in this space is a way of investing in our digital future. Visit https://www.digital-entrepreneur.co.uk/ for a full list of finalists.